Is $1 Million Enough To Retire On Today? Believe it or not, for many people $1 million will not cut it. This article shows you case studies and real numbers. The main reason is low interest rates. Twenty years ago, $1 million was more than enough money. I suggest using dividend-growth stocks instead of treasuries in today's environment. Who else remembers a time when $1 million at retirement meant you were really, really successful? Nowadays, many are wondering if that's even enough to retire on. They're right to be concerned because with interest rates so low, having $1 million might not cut it. With ever-present inflation combined with today's lower interest rates, $1 million isn't even close to what it was 20 years ago. In fact, using the Consumer Price Index (CPI), we find that in order to have the same spending power as $1 million 20 years ago, you would need $1.62 million today. Let's set the clock back 20 years and see just how a couple might have fared with $1 million saved. 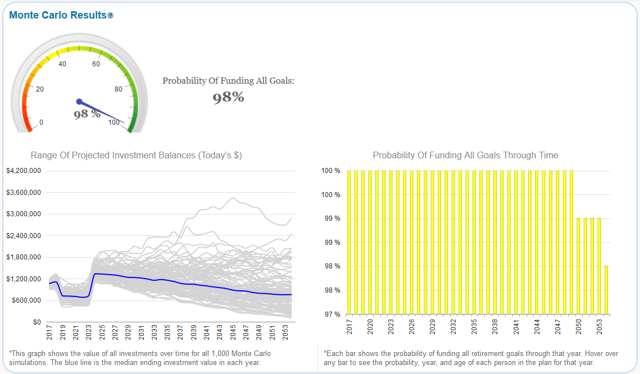 I used our publicly available WealthTrace Retirement Planner and I looked at a 50 year old couple that wants to retire at age 62. They have $1 million all in IRAs and they put everything into treasury bonds. That sounds crazy today, but 20 years ago interest rates were so much higher that this is actually what many people did. I also assumed this couple would spend $60,000 a year in retirement and they had $35,000 combined in social security payments. Lastly, I assumed they would live to age 90. When comparing to today's environment, the results were astonishing. They don't even come close to running out of money. In fact, they can spend $75,000 per year and still have more than $1.1 million left over at the end of their plan. Take a look at the graph below to see why. The key here is that their retirement income always covers their expenses. This way they are never dipping into their investment principal. 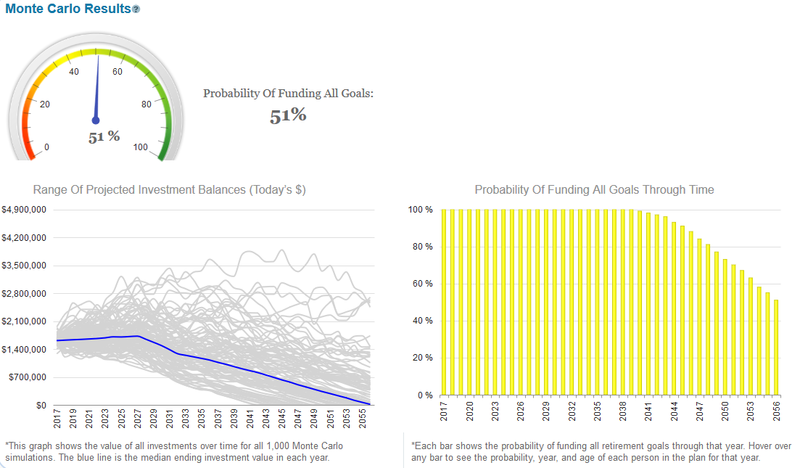 I also ran their plan through our Monte Carlo simulations and found that they have a 98% chance of never running out of money in retirement. Stable income in retirement always leads to better Monte Carlo results. The results we found in the case study from 20 years ago simply cannot occur today. The main reason is low interest rates. 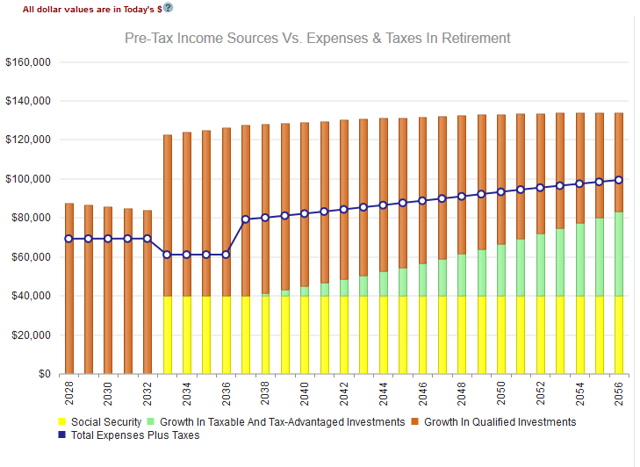 Even if we adjust the $1 million for inflation and give them $1.6 million and we increase their social security payments for inflation, if they move everything to Treasuries I found that their probability of never running out of money falls from 98% to 51%, all due to interest rates being so much lower. This couple needs more retirement income. That is the bottom line. So how do we find it? 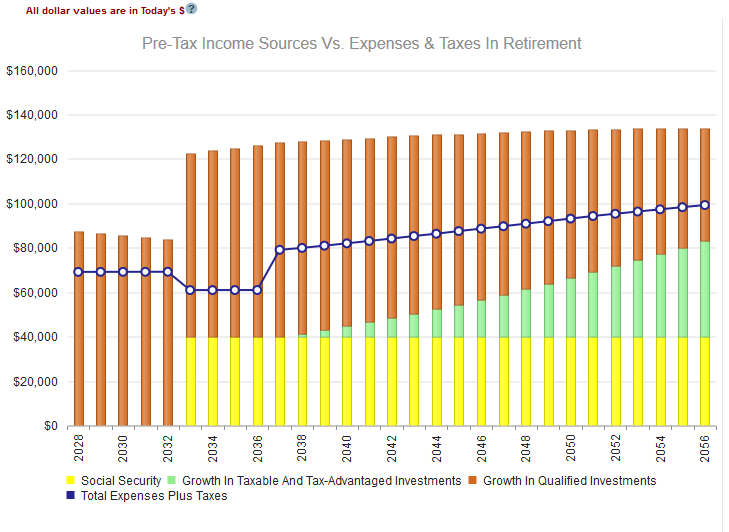 I suggest using dividend-growth stocks to boost their income in retirement, but not just any dividend-growth stocks. We are looking for dividend payers who won't cut their dividends in recessions and who have a long history of increasing their dividends over time. A few of my favorites for retirement portfolios are Altria (NYSE:MO), Exxon (NYSE:XOM), and Wal-Mart (NYSE:WMT). None of these companies has ever cut their dividend. Altria and Exxon began paying a dividend in 1970 and Wal-Mart in 1974. Perhaps just as impressive, all three of these companies managed to increase their dividends in the last serious recession in 2008/2009. They also have healthy recent dividend growth as you can see below. So let's work with these great companies. I found that if we moved 75% of their portfolio from treasuries to a portfolio of dividend-growth stocks that have similar metrics as the companies above, their probability of never running out of money jumps to 80%. There are two reasons for this large jump: 1) Their income goes up dramatically with increasing dividends over time and 2) Dividend returns are more stable than stock market price returns, which increases the probability of never running out of money in Monte Carlo simulations. We now know that $1 million is not what it used to be. But that doesn't mean we can't find great companies that will help us generate the income that treasuries used to. Disclosure: I am/we are long MO, XOM, WMT. I wrote this article myself, and it expresses my own opinions. I am not receiving compensation for it (other than from Seeking Alpha). I have no business relationship with any company whose stock is mentioned in this article.